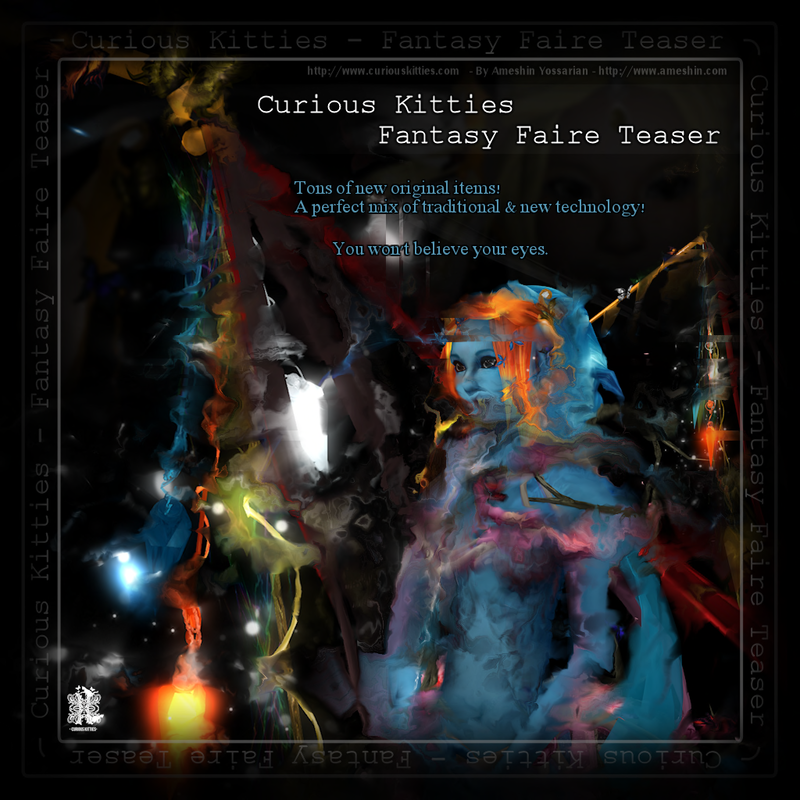 Ameshin Yossarian, the creator of Curious Kitties, shares with us her reasons to sponsor the Faire and her early-found love for fantasy. She also talks of her background as an artist and teases us with her upcoming Faire releases! I’d have a harder time thinking of why not to be a sponsor! I absolutely love the Fantasy Faire & hope it can continue to be a part of Second Life & RFL every year! I began building in Second Life when a customer from another popular virtual world at the time (in 2004) suggested I give SL a try. This is my 10th year in Second Life now! What inspires me to create in general is a natural drive. I’ve been an artist for longer then I can remember (I’m also a freelance artist/designer by trade) so I generally love to create in various mediums one of them luckily being 3D & textures which comes in really handy when creating in Second Life! I really love it when people can enjoy wearing & using the art I create, its very exciting even after all this time! This year I’m bringing TONS of items to the Faire! Magical, Elven, & Original Fantasy Genres! These new items are top secret & will be revealed at the Faire! Accessories, clothing & avatars using some new methods & new features! Plus some of the more classic designs for the more traditional Second Lifers! The first time I encountered the fantasy genre was probably before I had much understanding of the actual world. Probably starting at around 1~2 I enjoyed childrens picture books about fairies, mermaids, elves, goblins etc. I just generally love anything fantasy! Its unique & wild. The fantasy genre doesn’t have any really hard set limits so I love that! I don’t have a favourite Faire memory, but thats actually a good thing. I’ve been attending the Fantasy Faire every year & theres always special memories each time. The Faire & Second Life have been evolving, and its always extremely exciting to see an entirely new & unique Fantasy Faire each year! Thank you, Ameshin, for taking the time to chat with us. We’re honoured to have you join us again at the Faire!